Yes, you read that right. Strongbow Dark Fruit cider is opening a bakery. Sadly, it is only going to be a one-off treat, setting up camp in Manchester this Saturday (24th November) from 12-8pm. These eight glorious, sugar filled hours will give you the chance to try some rare delicacies such as Dark Fruit cupcakes or Dark Fruit ice cream sandwiched between two chocolate cookies. Most importantly, however, Strongbow is teaming up with the amazing Doughnut Time to provide you with homemade Dark Fruit doughnuts! The pop-up will be held in Barton Arcade in Deansgate and all proceeds from the baked goods will go towards local charities. If this wasn’t already enough to convince you to make your way down to Deansgate this weekend, the bakery will also feature the winner of a fan-led baking competition that was hosted by Example. Two super fans of the fruity alcoholic nectar baked Dark Fruit themed cakes in two hours and were scored on ambition, creativity and taste. The winner of this competition will be displaying their bake on Saturday – and yes, you get to taste it too. 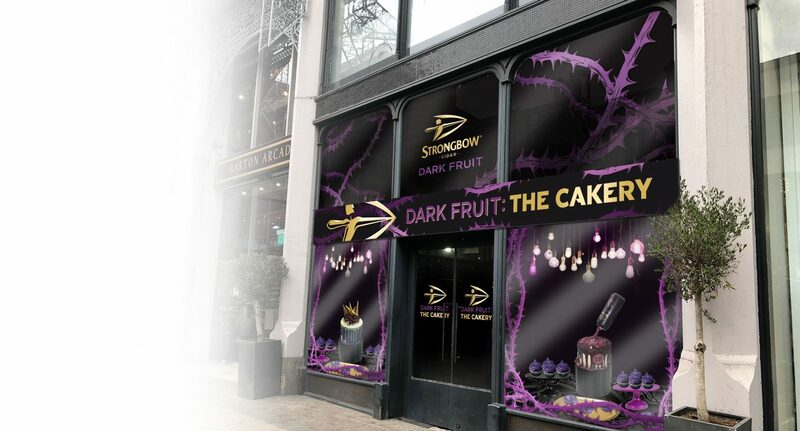 The bakery has been inspired by you – the Dark Fruit fans, as you took to social media and spread the joy, love and obsession with the cider by showcasing your inventive Strongbow Dark Fruit inspired bakes. In fact, earlier this year Manchester proved its worth to Strongbow, being voted one of the three cities that Kyle Gentleman’s Strongbow Dark Fruit ice cream should visit. So what better thing is there to do this weekend than head to Deansgate, treat yourself to a tipple of the drink of the Gods and coat your teeth in sugar? Dark Fruit fans from far and wide will be there, and I’m sure you don’t want to miss out on this once in a lifetime opportunity.